I often get people asking me what they can do when it gets too hot and humid inside their tent. 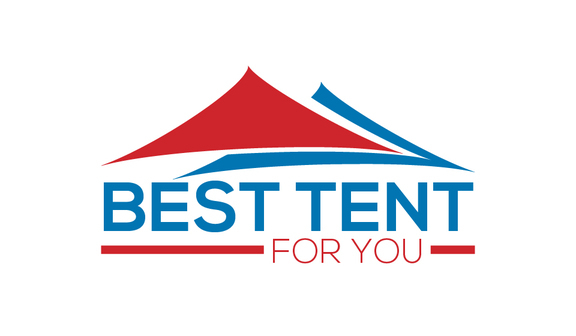 I always told them choosing the best tent can be a very important aspect. One with good ventilation – the best option for camping in a warm climate is a tent made from canvas – the Kodiak Canvas Tent. Though some people need more than just that alone, especially when they are camping in a warmer climate. 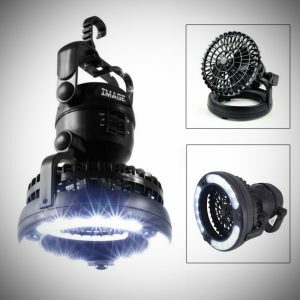 That is why I have decided to round up camping fans so I can find the best camping fan for you and your needs. 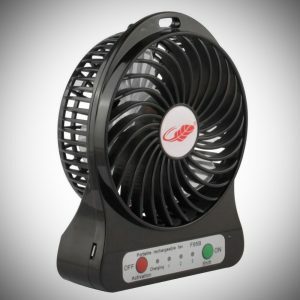 So, I have tested around 15 fans that would be suitable for camping. Below I have chosen my favorite 5 starting at number 5 and working my way to my personal favorite. All the fans that I tested could powered by battery and some had the AD/DC option as well. The first option is a fan made by O2 Cool. 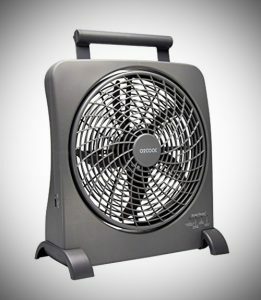 Is it a 10-inch fan, so its best suited for camping when you don’t have to carry it far from your car to the campsite. It obviously is not practical for someone who is hiking or backpacking -as it simply would use most of your backpacks carrying space up! Don’t get me wrong the weight of the fan itself it light, it’s about 3lbs, it’s just the size of it isn’t very practical to carry for an extended time. The base does fold over quite nicely and it does make it relatively easy to transport which is good. As I mentioned the base folds and can be used as a stand which I like as it makes using it a breeze, you just set it down and put up the fan piece and you are ready to go. O2 Cool have clearly made this as portable and practical as possible and you can see that. The battery life on this fan is one of the best options that I tested for a bigger sized fan, you can get up to 72 hours of typical use on one set of batteries! So realistically this can easily last you 6 days of running 12 hours a day. So, for most people I would imagine one set of batteries would be enough for a week’s trip, which is nice so you don’t have the inconvenience of having to change the batteries during your trip. It uses 8 D cell batteries, I would personally recommend buying some rechargeable batteries and recharging them yourself, it will save you a lot of money in the long run. One final thing I would like to mention about this fan is how quiet it runs. People like to go camping to get away from the noise and enjoy the quiet. This fan is on the quieter side in comparison to the ones I have used, you can hear it but it really isn’t that much at all. This is the best choice for you if you want long endurance on one set of batteries or one charge. 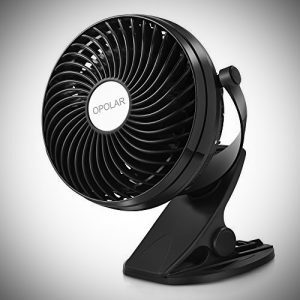 While this fan is designed for use on a desk that doesn’t mean it can’t be used elsewhere. I really like it because of its clip feature. It allows you to clip it somewhere. In my case I have an attachment in my cabin tent in the top middle typically where people like to hang a lantern, I actually clip it to that and I can adjust it to where I want it pointed. The fans size is 4.3 inches and has an RPM of 2200, which is basic terms means quite a satisfying airflow that I could appreciate even in a larger 8 person tent. One of the great features about this fan is that a rechargeable battery is built into the fan itself which makes for easy recharging using a USB cable which is included. I personally could get 5 hours of battery life on one charge when on the high setting on the fan – there are 2 speed settings low and high. OPOLAR says that that battery can work anywhere from 2-6 on a single charge. The great thing about charging it is you can do it so easily. I charged it mostly by using my power bank, the same power bank I use to charge my phone – you can check it out here. You can also charge it by plugging it into your laptop or anything with a usb port will work. I found this is be a great option for carrying when hiking or backpacking. I clipped it to the bottom straps of my backpack and that was it. It didn’t use any space in my backpack and was securely attached. Even though it wasn’t designed to be portable it works a treat! This Rasse is about the same height as an iPhone so it is the smallest in this list so far. Don’t let its smaller size fool you though – it can put out a strong force with its 3 different speed settings. You have a nice adjustability depending on what air speed level you would like. It could easily be used in a larger tent, it can have an effective blowing range of about 4 meters so I don’t think the power is an issue here! This fan is another fan that has a built in rechargeable battery. I really wish more of them had this feature as it is a big selling point to me as you don’t have to constantly replace the batteries unlike this one where you can easily and freely charge via a micro usb cable. While Rasse say you can get up to 8 hours on one charge I personally managed 6 with mine which I was quite happy with. Usually enough for a single day’s use. You can charge it by your laptop, power bank or even your car charger, it offers a lot of flexibility which is nice. And as it uses micro usb you will already most likely have spare cables if you did happen to misplace the one that’s included with it. Another thing to mention here is there is a flashlight on the lower side of the fan. It’s a nice feature if you ever need to use it. Though I wouldn’t recommend the flashlight for anything serious. 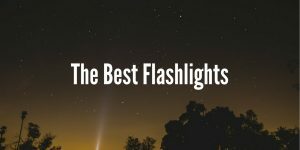 I would instead recommend checking out your round up of the best flashlights here! One final thing to mention is the sound this fan produces is above average I would say when comparing to other fans, when on the lower and medium settings though it still is quite quiet with being a little louder on the highest setting. This fan is a lantern with a fan built into it. So basically, you get 2 for the price of one with this option. 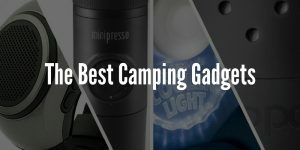 It’s also one of the cheapest options so I would recommend this if you are a camper on a budget. Of course, the best place to position this is to hang it from the top middle of your tent. That way you get the best value out of both the lantern and the fan. You can adjust each element independently. In my case I pointed the light directly downward and the fan at the angle that I liked. You don’t have to use both aspects at the same time you can use both or one or the other as you like which is great and stops from battery wastage. There are 2 settings for the light and the fan, increasing the intensity for each as you like. The size of the fan is about 4 inches and it puts out a solid amount of air, I would rate it 7/10 and the lantern aspect I would rate 8/10. Instead of having one light there are 18 small leds with could be used as your main lantern. I really like the effect it gives off when its turned on, it looks like an expensive piece of gear! It takes 2 D batteries which are not included so again I would recommend picking up some rechargeable batteries like these here. A new set of batteries that are fully charged can make up to 16 hours when the light and fan on both on the lower setting. So really its quite impressive, one of the best for battery life. This really is the my favroite fan on the market, there really is no question for it, no one comes close when it comes to a bigger portable fan. It’s another fan from O2Cool. 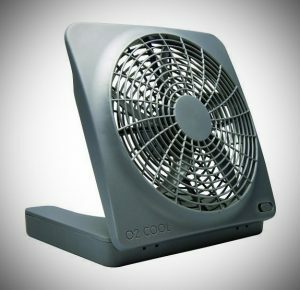 This fan is a 10-inch fan and while it may be in the higher price range when it comes to fans you can tell exactly why when you use it. First of you can use this fan how you like when it comes to power options, you can use AD or DC adapters that are included, 8 D cell batteries that aren’t included or the built in rechargeable batteries. When it comes to using the rechargeable batteries that are included I found myself getting about 6 hours of battery life on the low setting (2 settings included – low and high). I personally recharged the battery using my car lighter but you can also recharge at any wall outlet. Basically, if you going to be using this a lot (over 6 hours a day) I would suggest having 2 sets of rechargeable batteries which you can switch out as needed. The fan sits on 4 feet and can be tilted to the angle you would like. 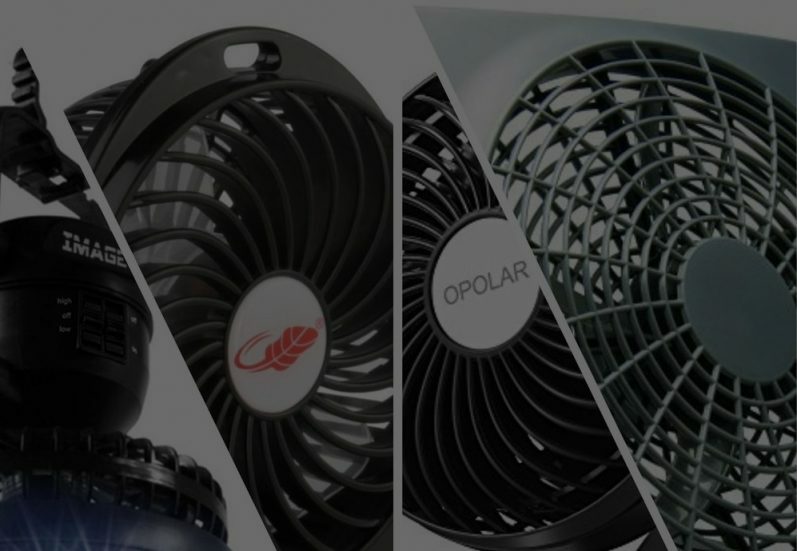 It’s the best fan for adjustability that I used! It’s easy to carry using the built in flip up handle and its light which makes it surprisingly portable for its size. It weighs about 3-4 lbs. The build quality of this fan is the best out of all. It feels sturdy and made from premium materials all while remaining quite light. I particularly like it on its lower setting because it provides a more natural feeling breeze that is refreshing especially of those hotter days. The great thing about this fan is its portability although you could easily use it at home if you liked. One final neat feature about this fan is it has a USB port which you can use to charge your devices such as your mobile or tablet which is a nice touch. 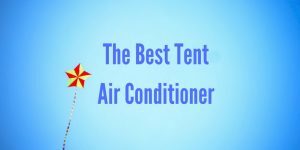 Overall this is the best fan for camping if you are on the market for a larger option, it really should be a no brainer if you are willing to spend that little bit extra!